Put your unique brand image on your glassine and paper food bags to increase business. Keep customers coming back with top-quality paper mailing bag packaging from BEE Packaging. Advertise your business on your packaging and stand out and get noticed with custom printed SOS bags from BEE Packaging. Our low minimum orders on printed or hot stamped bags make it possible for organizations of any size to promote their brand. Let us help you sack the competition with personalized bags that fit your budget. With stock and printed minimums as low as one case, any size restaurant can have professional, personalized packaging. Low minimums also make BEE the ideal choice for promotional pieces and special occasion packaging. Why not print a coupon for a return visit? Or create a stylish handled bag that they’ll continue to reuse? Get more mileage from each customer visit with our stock and custom carry-out bags. Printed FOIL PAPER bags. Dry Wax paper bags, snack pak, unwaxed tissue, waxed tissue, bleached kraft, glassine bags, duplex bags, triplex bags, white clay coated, and natural brown kraft bags. Choose from a variety of bag styles, colors, and custom print options to personalize and create a brand image ideal for your customer’s packaging appetite! Many in-stock sizes available with minimums as low as one case plain, printed or hot stamped. Or, work with our helpful sales team to create a custom option. Revitalize your brand image with paper shopping bags and totes. Plain paper sacks for immediate shipping. Eco-Shipper® and Eco-Natural plain and printed paper bags have been used for years by large, cost-conscious shippers around the world, and now smaller shippers can take advantage of this environmentally-friendly shipping option. These economic mailers can compete with plastic shipping bag pricing. One-case minimums on stock and custom-printed Eco-Shippers make them ideal for online retailers large and small. 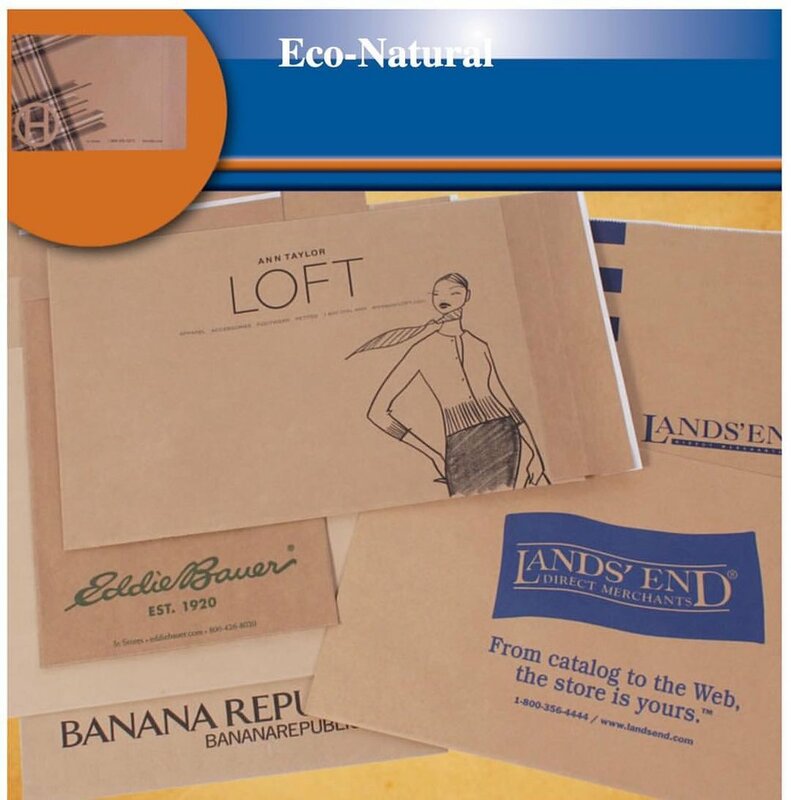 Ebay and Etsy sellers and large chain stores like Lands End, Ann Taylor and Eddie Bauer appreciate the strength, convenience and appearance of these attractive, 100% recyclable mailers. Clothing apparel mailing bags custom printed. Natural brown kraft environmentally friendly shipping option. Stock sizes and colors. Custom logo printing available. Contact us with your project. Eco-Shipper® and Dura-Bag® shipping bags are an eco friendly shipping solution. Paper shipping bags have been used for years by large, cost-conscious shippers around the world. One-case minimums on stock or custom-print mailing shipping bags make them ideal for online retailers large and small. Ebay and Etsy sellers and large chain stores like Lands End, Ann Taylor and Eddie Bauer appreciate the strength, convenience and appearance of these attractive shipping envelopes. Bee Packaging specializes in providing customers with quality printing on paper bags, paper sacks, and paper supplies tailored to their individual needs. Printed paper bags printer glassine printing drug pharmacy pharmaceutical food apparel mailing. We offer an array of printed paper bag products to accommodate many specialized lines of work and area committed to helping you find the options that best suit your needs. For those in the agricultural field, we offer a range of heavy duty agricultural farm bags. We also stock single and double wall paper bags, tube bags, and other agricultural storage products. These are perfect for your storage, sale, or transportation needs. Our customers in the automotive industry will be pleased with our durable automotive bags and sacks. They are built tough and able to withstand the sharp, metallic edges of automobile parts, as well as the grease and grime often associated with them. These rugged and reliable storage and materials sacks are made to handle anything encountered on a job site. Whether you need heavy duty bags to carry parts or a simple paper bag to store your contracts, Bee Packaging has the right products for you. Our company offers a variety of food service bagging and packaging options. All products geared toward food service meet stringent standards and guarantee quality. We offer products that are perfect for grocers, high end restaurants, and fast food chains. Concessions desert and paper cookie bags. Bakery cookies bags, bbq sandwich bags, bread wrap, bread and breadstick bakery bags. Burrito taco and tostada bags, carry out bags, carry-out food pail bags, oriental food bags, chicken sandwich bags, corn dog bags, foodservice paper bags, deli sandwich bags, doggie bags, dry wax paper bags, dry ice bags, egg roll bags, fish sandwich bags, hamburger cheese burger bags, foil hot dog bags, foil paper bags, grease resistant bags, french fry bags, fried pie bags, glassine bags, pizza bags, kraft paper bags, liquor bags and sacks. Paper wine bags, peanut and popcorn bags, pickle bags, ribs to go bags, sandwich wrap, submarine sandwich bags, won ton bags, and waxed paper bags. Contact us with all your paper bag requirements. Those in the travel and tourism industry will be pleased with our hospitality bags and liners. These products are durable, dependable, and are manufactured with hotels and motels in mind. Our industrial bags are meant for industrial and manufacturing storage. They have the capability of storing light to heavy objects and are built to last. Hotels, motels, and anywhere offering housekeeping or janitorial services will be pleased with our line of janitorial and laundry supplies. Whether you’re looking for janitorial or specialized laundry bags, Bee Packaging has what you’re looking for. These bag are designed for storage, disposal, and transportation of medical and health care products. They are designed for both durability and safety, ensuring protected transport of anything from patient possessions to hazardous waste. Paper pharmacy bags drug rx for pharmaceutical packaging. Department store apparel mailing bags for wholesalers, and other retailers will be interested in the wide array of merchandise paper bags and sacks from BEE Packaging. We have a number of stock sizes and can custom print your company logo. When it comes to packaging solutions for physician’s offices and pharmacies, BEE Packaging has just what the doctor ordered. Our plain stock or custom-printed pharmacy rx drug bag for prescriptions. Merchandise SOS bags are ideal for dentist offices, dental labs, pharmacies large and small, and hospital gift shops. Don’t forget online pharmaceutical companies – our shipping bags are a cost-effective and attractive option to help reduce shipping and mailing costs. Contact our packaging “specialists” today – we’ve got the cure for every packaging opportunity! We offer a line of bags, sleeves, tubes, and promotional sacks to be used as long-term packaging and display. They are best used in a showroom or shelving display setting. Our parts bags and sacks are perfect for the storage and transportation of parts, no matter their shape, size, or material make up. Bee Packaging offers a line of bags, sacks, and papers that will drive sales during your next store promotion. Bee Packaging is your business logo paper bags printer. Printing paper bags with different styles and colors including specialty paper bags for foodservice bags, pharmacy bags, shipping bags, and retail shopping bags. Contact us with your next custom printed paper bag project. Send your artwork for logo image printed bags. Retail packaging bag printers. More than packaging...your image is IN THE BAG! From one case to one million, We make it easy to provide you with a personalized brand message. Choose from a multitude of retail paper shopping bag packaging options in vibrant colors - as well as a variety of sizes and basis weights. BEE Packaging is proud to deliver food service packaging options for the restaurant, bakery, and concession markets. From a family-run food truck looking for a small order to a multi-location chain restaurant looking to take advantage of volume discounts, we can provide quality plain or printed french fry bags, carryout bags, bread bags, popcorn bags, and more. Contact us to buzz over a quote for your next batch of packaging.